This is the final part of How to Make a Picnic Blanket Skirt (see also part 1 and part 2). 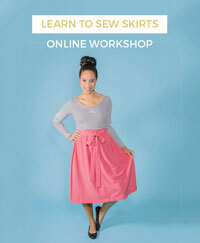 Just a few more steps and you'll have your own button-down gathered skirt. Yay! - To help make the placement of the gathers nice and even, put some little markings along the bottom edge of the front waistband piece (the interfaced one) where the side seams and centre back of the skirt should go. Mark the centre back of the skirt too. 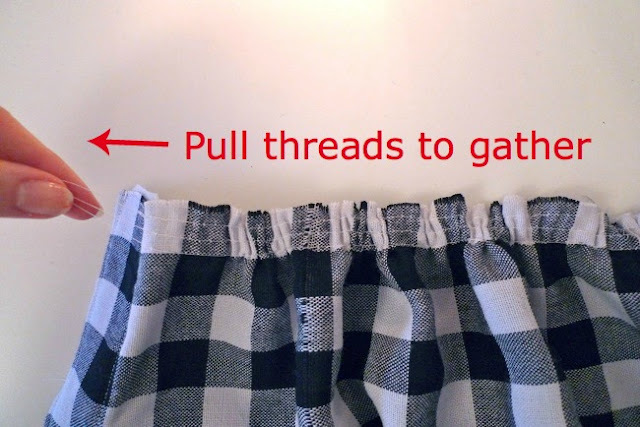 - Gather stitch along the top of the skirt by sewing three rows of long stitches (preferably in a different colour thread) parallel to each other and leaving long thread tails at the ends for pulling. Tilly Tip: If you try to gather stitch along the entire length of the top of the skirt, your threads will probably snap as there is so much fabric to gather. Instead, divide the skirt into four segments and gather stitch each separately – left front piece, left side seam to centre back of back piece, centre back to right side seam of back piece, right front piece. - Form the gathers on one of these segments by holding the three threads from one end of the stitching and pulling on them as you use your other hand to help the fabric scrunch up evenly. Keep doing this until the gathers are nice and even and the skirt pieces fit the matching segment of the waistband (the waistband markings should come in handy here). - Place the front waistband piece on top of the skirt right sides together. Pin this segment of the skirt to the matching segment of the bottom edge of the front waistband piece only (NOT the back waistband piece) using lots of pins to keep the gathers in place. Then gather and pin in the same way along the other segments of the skirt. - If you’re more patient than I am, baste. If not, just skip straight to the stitching part, sewing the front waistband piece to the top of the skirt, being careful not to catch the back (non-interfaced) waistband piece. - Tilly Tip: If your fabric is on the heavy side, stitch again to reinforce it as you’ll have quite a weight of fabric hanging down from a relatively small waistband. - Remove the gather stitches. This is why it’s a good idea to sew them in a different colour – so you can more easily identify which stitches to rip out. 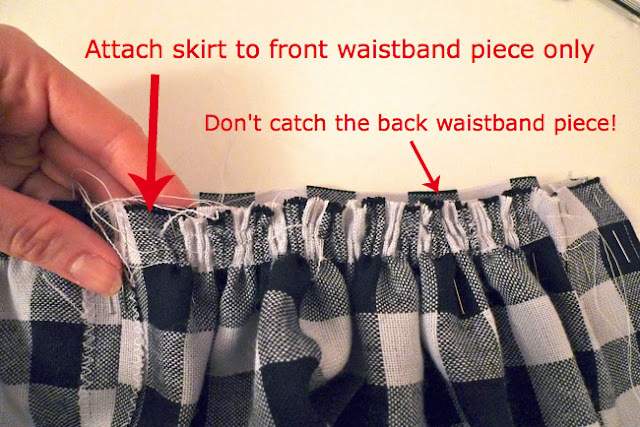 - Press the waistband away from the skirt. - On the back (non-interfaced) waistband piece, press the seam allowance up (wrong sides together) and pin it to the other side of the skirt. - If you’re more patient than I am, slipstitch by hand. If like me you can’t wait to finish this beauty, machine stitch - topstitch on the front/outside of the waistband close to the seam line. 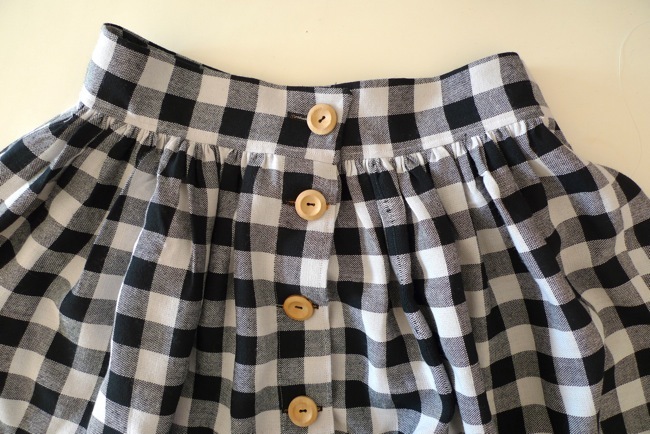 A few people who've sewn this skirt said they prefer to do the buttons and buttonholes before hemming so they can make sure both sides match up at the hemline. If your fabric isn't geometric like mine - and thus not so easy to line up each side - this is probably a good idea. Personally I prefer to do the hemming first so I know how many buttonholes to add. 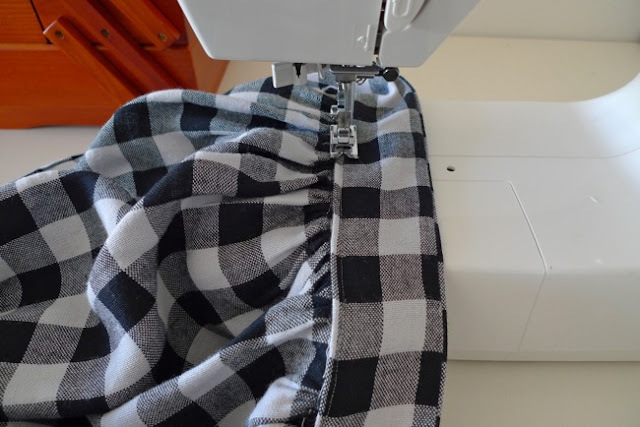 - Because you’ve got lots of fabric hanging down, it’s a good idea to let the skirt hang for a few hours or overnight before hemming in case the fabric stretches. 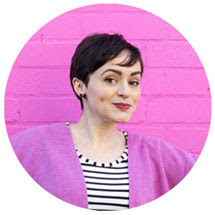 - Try it on and adjust the hemline if necessary so you’re comfortable with the length. - If you went with a 2” hem allowance, fold it up by just a tiny bit under 1” and press, then by another 1” and press again, then pin in place. Again, if you’re patient you can slipstitch the hem by hand, but remember you’ve got a lot of fabric there to cover! Otherwise go for a machine stitched hem. You could try a decorative topstitch like I did on my Thinking in Shapes Skirt to make a feature out of your laziness! - On the right placket, you need to mark the buttonholes. First mark the vertical position with little dots or crosses. You’ll definitely want one on the waistband, then you’ll want to place the rest evenly down the length of the skirt, maybe around 3” apart from each other. - Next mark horizontal lines for each buttonhole. If you’re using a flat ¾” button, the buttonhole will need to be 7/8” long. The buttonhole should start 1/8” from the left and overlap the centre of the placket (the “fitting line”) by 1/8”. The buttonholes don’t sit dead centre as you want the buttons themselves to be centred and the buttons will slide towards the right edge of the holes. - Now you need to mark the positions of the buttons on the left placket. 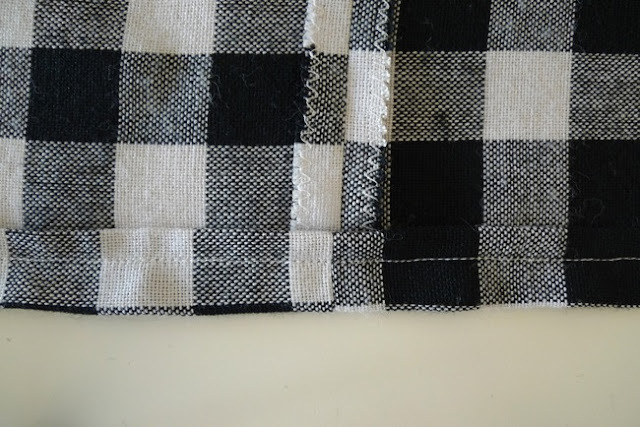 Overlay the plackets as if you’re buttoning up the skirt, then pin them together evenly. Slip your marker (chalk pencil, washable pen…) through each buttonhole to mark the vertical positions along the left placket. 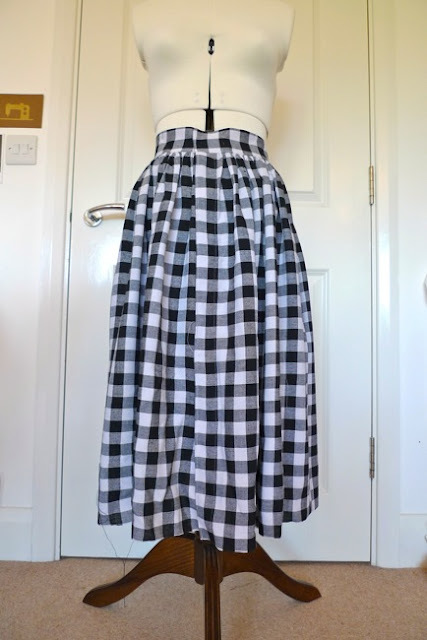 The horizontal position should be dead centre to the button stand, but you may want to adjust the waistband one slightly to your preference while trying on the skirt. - Sew the buttons onto the left placket. If you make your own Picnic Blanket Skirt, I’d love to see it! Please do share a link below to your blog, Pinterest, Flickr or wherever. I may feature the pictures in a future post so if you’d rather I didn’t borrow your image just leave a note with the link in the comments.